Joshua Schlote, a licensed veterinary technologist and an instructor in the college’s veterinary technology program, demonstrated the procedure recently for his students. He said there are several reasons why a fish could be anesthetized. One is if they suffer from an ailment, such as swim bladder disease. Other surgical procedures conducted on fish are tumor removals and eye enucleation (removal). Anesthesia can also be used in procedures to treat a bacterial infection known as ick and on biopsies to determine what kind of antibiotics may work in treatment. Schlote said the use of anesthesia in fish is not common in veterinary practices, but it is done more at zoos or places that have invested heavily in their fish stock and tanks. Anesthesia on fish has also become common in clinics and in research. The University of Florida offers a program in fish and aquaculture medicine. In addition, Schlote said tilapia are being used in skin grafting on both humans and in the veterinary industry. He cited cases where veterinarians used tilapia skin grafts on animals injured in the most recent wildfires in California. Anesthetizing a fish is similar to giving it to a human or animal, as Schlote demonstrated to his students. The fish, in this case, Schlote’s own palm sized goldfish named “Stashy,” is removed from its tank and placed into a separate holding tank that has the solution. As the fish breaths, the agent is absorbed into its blood stream. Once Stashy was feeling the effects, Schlote placed a tube in her mouth. After a few minutes, Stashy started bumping into the side of the tank. As a fish becomes more anesthetized, it is still coherent. While the goldfish was on the table, Schlote used water to keep its scales moist. To keep it anesthetized, he pumped the water mixture through the gills. The most opportune way to anesthetize a fish is by going through the mouth as it provides better coverage to both sets of gills. But Schlote said there is another way to administer the anesthetic. Schlote was careful with the fish - even wearing rubber gloves, and with good reason. “It’s because fish have a slime on the onside that actually protects their scales,” he said. “So, if you take all that slime off, you actually predispose them to things like ick on their scales, fins and gills. When it was time to start recovery, Stashy was placed in fresh water and by Schlote physically moving her back and forth to get fresh oxygen to start a fresh flow through her. “She’s starting to come back around; she’s starting to fight me a little more,” Schlote said as he held Stashy. Within 15 minutes of first receiving the anesthetic, Stashy was upright and back to normal swimming happily around its tank. 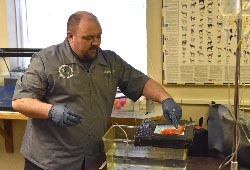 Joshua Schlote, a licensed veterinary technologist and an instructor in Northeast Community College’s veterinary technology program, demonstrates the use of anesthesia in fish to his students recently in the program’s lab on the College farm.